Our 'Little House' close to Bormes and Le Lavandou provides a choice of beaches against the backdrop of the Des Maures Hills. Bormes has the reputation of being the sunniest and prettiest village on the Cote d'Azur. 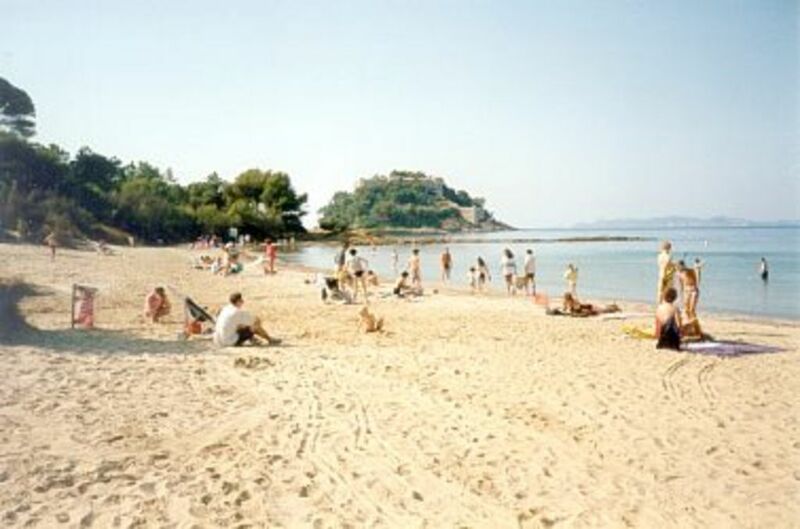 Le Lavandou is a bustling resort providing a splendid choice of restaurants, and departures for the Isles d'Hyeres. We have the shared use of a pool and tennis court. Golf at Val Cros is 5 miles away. There is no TV or telephone but we do have WIFI. I am a retired solicitor and my wife is a retired librarian. We have lived at Kingsland Cottage Parkham Bideford for 42 years. We own our French property jointly. the bathroom is a shower-room. There is no bath. We have recently had all the fittings renewed. There is a toilet in the shower-room. There is also a separate toilet downstairs. There are wall heaters in all the rooms, Our prices include electricity. The room downstairs is just one fairly large room. Our property is described as having 3 pieces. The table will seat 6 at a pinch but there are only 4 pine chairs but we have 8 white plastic chairs. We have one large plastic table and one small one. There is a selection of various card and board games. There is a selection of buckets and spades for children. There are two bicycles but no helmets. Renters must provide their own sheets, duvet covers, pillow slips and towels. The hob has 4 rings. There is no central heating. For those who rent during the winter and spring there are electric wall heaters which provide plenty of warmth. There are 2 sun-loungers for use on the balcony; we keep the cushions in the cupboard in the 2nd bedroom. I would definitely recommend this property as a good base for a stay whilst visiting this lovely region of France. Although it is on the small side there is ample space for a family of three or four. It has a cosy feel to it with heating for the cooler months but also would be ideal for warm weather with nice cold tiled floors, shutters on the windows and doors, there's also tables and chairs outside. Barbeques are provided. There are even bikes stored in the shed which are good for local cycle rides. The kitchen has all you need to make and cook meals etc and a large refrigerator. The lounge/dining area is a good space which is nice to relax in. Upstairs the two bedrooms were bigger than expected with a good amount of storage space. Mattresses were also comfortable, no aches or pains. We would definitely like to visit again and stay in this nice house. Thank you very much for the splendid review. It goes a long way to repairing the damage done by the previous renter! I'm glad the wall heaters were working satisfactorily; a fuse had blown which was easily repaired; likewise the flow of waste water from the kitchen sink was very simply remedied. We've never had any complaints about the double-bed and mattress and are delighted that you found everything comfortable enough. I'm pleased, too, that your husband enjoyed the use of the bikes.We do our best to keep them in good order but I think I should point out that there are no helmets in the Little House. Thank you again for the kindly review; we do hope you will consider booking again. We would be delighted to have you back! Anna and Jeremy Wright. Highly recommended holiday home having stayed a few years now it never disappoints in comfort and facilities, plus shared swimming pool, lovely. Many thanks for your very kindly review. We are always delighted when renters make return visits. The pool is definitely a bonus and well maintained by our Residents' Association as is the tennis court.Jeremy and Anna. ein süsses schönes Häuschen zum Wohlfühlen! A nice little House! We were in the little nice house for 3 times now and we always liked it very much. It's big enough for 4 people in a quite area. In the house is everything we needed.The owners are very friendly and helpfull! Thank you so much for your very kindly review. Your English is brilliant. We agree that the Little House is best for a family of four. Five is just possible providing there are three young children. We look forward to seeing you again. Many thanks, Jeremy Wright. It is the 5th time we have stayed here. It is convenient for many of the facilities we enjoy and well placed to visit further away. Many thanks Michael and Helena for giving us 5 Stars. We can't believe that you have stayed in the Little House on 5 occasions but 'tis true. We hope there might be more; you must ask for a discount! Jeremy and Anna. Lovely little house with absolutely everything we needed. The children loved the swimming pool and tennis court. Close to Pins de Bormes, perfect for breakfast (and a great little market on Tuesdays). Le Faviere, Le Lavandou and Bormes village less than 5 minutes away. All three were great for evening strolls and well worth a visit. We had a perfect two weeks and we will definitely be back. Many thanks Barnaby for taking the trouble to write a review. I think I should point out that Barnaby is our son so please disregard the 5 Stars he gives the Little House but what he says is probably fair comment. We certainly have the use of a swimming-pool and tennis court. 5 minutes to Pin de Bormes and Le Faviere yes; perhaps a little longer to the Le Lavandou sea-front and Bormes Village. Bormes les Mimosas is a hill village with magnificent views over the Med; it is considered one of the prettiest villages on the Cote d'Azur and the floral displays in every nook and cranny are magnificent. Your Mother and Father. We (four persons) felt at home immediately in this charming little house. It is well equipped and we had anything we needed. In the garden there are chairs and tables both in the front and the back of the house so we had all meals outside. Furthermore there are sun loungers on the balcony. A reserved parking place is located in front of the house. After returning from our excursions we used to take a bath in the big pool just a few minutes away from the house. The owners are very friendly. We didn't meet them but we've got a large documentation by e-mail. They also got in touch with us during our stay. The wonderful old town of Bormes-Les-Mimosas in the hills and the lively La Faviére at the harbour are reachable in a few minutes by car to play boule or enjoy ice cream. Nearby there are lots of gorgeous sandy beaches. We didn't have enough time to try them all - neither the beaches nor the ice creams. We enjoyed our holidays very much and would like to come back to the "little house". Thank you so much Maya and Jens for your splendid and much appreciated review. Your English is well nigh perfect. I wish I could speak and write in German as you do in English. Our English friends will smile and know that you and the family bathed in the pool and didn't take a bath! We understand that your daughter particularly enjoyed the pool; it is certainly used by the residents but big enough for all. Like all large pools it is shallow at one end but deep at the other. Just right for children. If you ever wish to stay in the Le Lavandou area again we would love to have you back. Anna and Jeremy. Le Lavandou is some 20 miles West of St. Tropez and a recent Sunday Times travel article suggests that the resorts to the West are more enjoyable than those to the East. The Le Lavandou beaches ( St. Clair, Fossette Plage, Cavaliere, Faviere,Cabasson and Estagnol) are particularly recommended. They are superb. A trip to the Isles d'Hyeres and especially Isle de Port Cros is a must. The backdrop to Le Lavandou is the range of Des Maures hills; these provide splendid walking opportunities and the roads/lanes by car are quite exciting!